The Bachelor would like to invite the leadership of every student organization to submit a brief news item for the back-to-school issue. This issue, in addition to winning several ICPA awards for last year’s edition, is distributed to the entire Crawfordsville Journal-Review circulation. It has increased on-campus prominence as well. This is a great way to let both the Wabash and wider Crawfordsville communities know what is going on in your club. 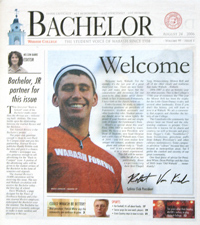 In April 2008, the Bachelor will celebrate its centennial. Since 1908, it has been the "student voice of Wabash College." Informational pieces like these, sent in by the clubs and organizations themselves, keep that tradition alive. The Bachelor relies on students to let it know what is going on and when. The recent coverage of the College Hall construction issues, for example, was almost entirely driven by students. If your club has something to say, now would be a great time to say it. When writing these stories, please keep in mind a 300-word limit, but feel free to share any interesting or important information. Something worth including, too, is the first callout date for interested students. These pieces will run on 23 August, so if you want them included, you need to e-mail them to Editor-in-Chief Patrick Smith (smithp@wabash.edu) and News Editor Rob Fenoglio (fenoglir@wabash.edu) by 17 August at 6 PM. Smith is Editor of The Bachelor for the 2007-2008 school year.